Huge Savings Item! 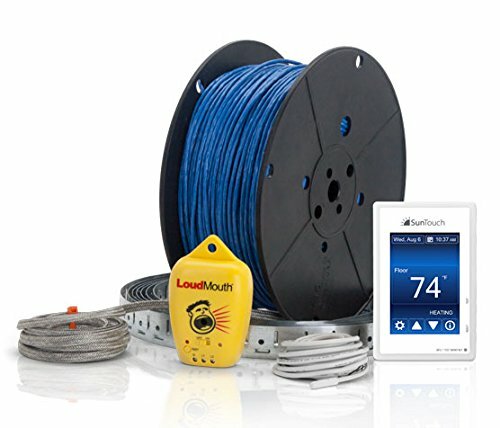 Save 11% on the SunTouch WarmWire (120V) Floor Heat Kit, 70 sq ft cable adaptable to any layout and adds luxury and comfort to any room under tile/stone includes user-friendly Command Touch Programmable Thermostat by SunTouch at The Synthesizer. MPN: 81009490. Hurry! Limited time offer. Offer valid only while supplies last. WarmWire cable is an affordable alternative to radiant floor heating mats that helps keep bathrooms, kitchens, and entryways cozy, dry, and safe. WarmWire cable is an affordable alternative to radiant floor heating mats that helps keep bathrooms, kitchens, and entryways cozy, dry, and safe. Complete design freedom. WarmWire can be adapted to fit around fixtures in your layout. Note: Never cut WarmWire; it is unable to be shortened or extended. Multiple cables can wired in parallel to the same thermostat (included) up to a total load of 15 amps. Installs easily with complete design freedom for going around turns, fixtures, and obstructions. Kit includes cable, touchscreen programmable thermostat, floor sensor, and install accessories. If you have any questions about this product by SunTouch, contact us by completing and submitting the form below. If you are looking for a specif part number, please include it with your message.